Cloth Diaper Revival: The Easiest One-Size Diaper You'll Ever Use! The Easiest One-Size Diaper You'll Ever Use! This post contains sponsored content from Tidy Tots as part of the 10,000 Fans Celebration. Most cloth diapering parents love one-size diapers because of their economic benefits. One diaper that will fit your baby from birth to potty training is a huge perk! No need to buy more and more diapers as your baby grows at a ridiculously fast rate! Recently, my favorite cloth diaper store discovered a new brand while at ABC Kids Expo earlier this year. Tidy Tots is USA brand that makes one size diapers unlike any other OS diaper on the market! One of my favorite things about Tidy Tots is a self-adjusting rise! No rise snaps, buttons, or other hidden tricks to get these diapers to fit your baby. The elastics are designed to stretch and fit your baby as needed. But the best part is the elastic isn't stretching out as your baby grows. It shrinks back to the original size so you can use these diapers again and again on future babes! Another bonus, is that Tidy Tots is made with double gussets to protect from blow-outs! Tidy Tots is an all-in-two system. 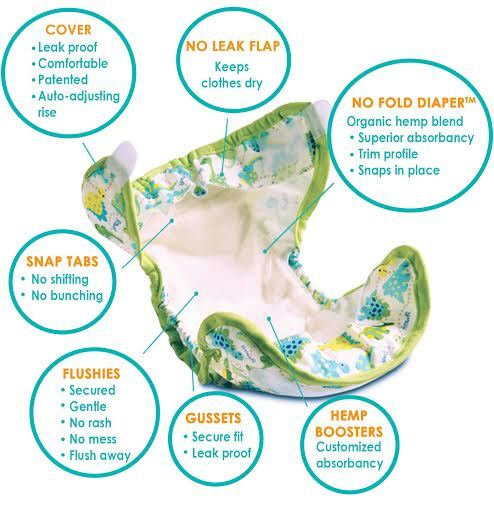 The No-Fold diaper snaps into the cover, but there's also a pocket to add a hemp booster for more absorbency. The best part is you don't have to unstuff the booster, it just wiggles it's way out in the wash! With Tidy Tots, there's no need for a diaper sprayer or worrying about voiding warranties with diaper creams. When you use Flushies on top of the diaper, you are protecting the diaper from stubborn creams and the liner does all the dirty work! Just flush away the poop and the liner. Plus, the liner is made of cornstarch which helps with diaper rash. With this system of diapering you'll be able to reuse the cover for multiple diaper changes and just swap out the diaper and boosters in between changes. Tidy Tots is manufactured in upstate New York at a facility that supports individuals with disabilities. 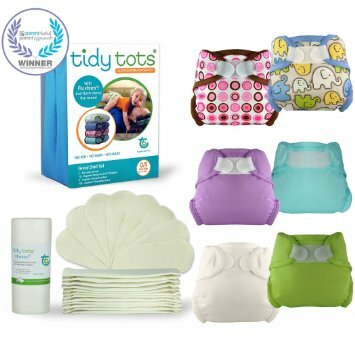 Tidy Tots not only has one-size diapering sets, but also newborn sets as well. You can enter to win a Great Start Set, everything you'll need to diaper your baby!, in the 10,000 Fans Celebration.